Yagul flourished after the fall of Monte Albán; Later, after a short abandonment, the area resurfaced again to become a city-state, in the valley of Oaxaca, which prevailed until shortly before the arrival of the Spanish conquerors. The main structures of Yagul were distributed in different planes and can be grouped into three areas: the Civic Center, the Fortress and the Housing Zone. The Civic Center is the center space of Yagul and there the most important structures of this impressive Zapotec fortress were built. Yagul is located on a steep hill in the Tlacolula Valley to the east of Oaxaca City. 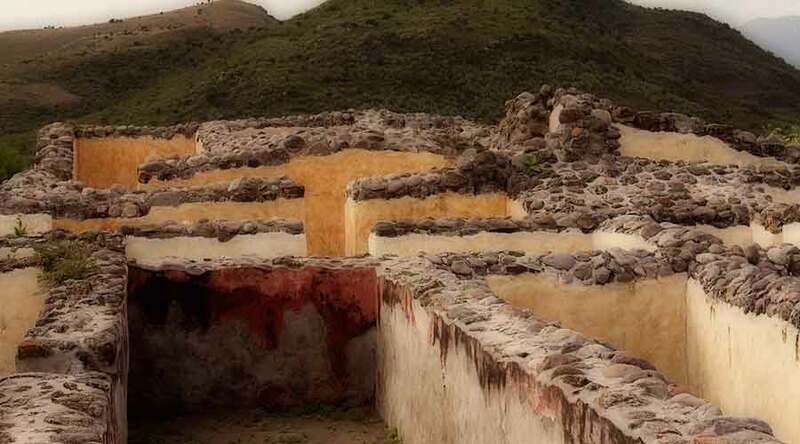 This site emerged as the guiding center after the decline of Monte Albán, which is why it is identified as part of the Late Classic or Epiclassic city state areas. The main structures and buildings of Yagul were distributed in different planes following the slope of the hill from north to south. One of the most interesting aspects of Yagul is the presence of mural paintings on floors and walls of its structures, an element that has deserved the attention of scholars, not only of archaeology, but also of art historians. This set consists of four tall platforms that delimit a small square with a central shrine. To the west is the entrance of a triple tomb; the main one has the façade decorated with frieze motifs carved in friezes formed in the rocks. At the foot of the temple on the west end of the square is the stone sculpture of a frog of monumental dimensions, which has a cavity on its back, probably to capture water and used it for ceremonial purposes. Construction consisting of six housing complexes and with an extremely restricted entrance. The sets were composed of rooms that delimited quadrangular courtyards. Thanks to the archaeological materials associated with the rooms, it is known that they had domestic use. In addition, in each patio the entrance to a tomb was found. There is evidence about the occupation of Yagul from the time of Monte Albán l (500 years BC). It flourished as an urban center after the decline of Monte Alban (800 years AD). Later after a short abandonment, Yagul returned to resurge to constitute itself as a city-state, in the valley of Oaxaca, which prevailed until shortly before the arrival of the Spanish conquerors. It is located on the top of the hill, sheltered by natural and artificial walls from where a great panoramic view of the site is overlooked. Area of ​​common rooms. They are located around the hill, of which there is little exploration. It is located southeast of the city of Oaxaca 36 kilometers (22.37) by the federal highway 190 to the Isthmus of Tehuantepec. Passing the population of Tlacolula de Matamoros (500 meters ahead), deviate to the left 2 kilometers (1.24 miles) approximately. Approximate time: 50 minutes.